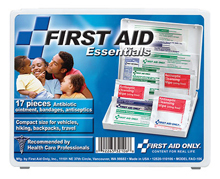 Our school first aid kits are a very popular idea for school organizations, school fundraising events & programs, clubs, charities, boy scouts & girl scouts, student nurse associations, sports leagues and teams, church youth groups, day care and pre-schools. We can also create a custom label. **The FAO-120 has been specially designed for use with the Ready Label Progam. Though it has been designed with the intention of private labeling, this kit comes standard with a stock label. 21 Piece all purpose kit, mini plastic case, 1 ea. 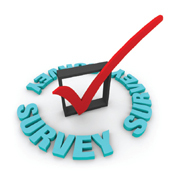 Be ready for all potential emergencies at school, home, in the car, outdoors or on the water. 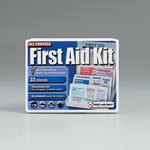 From cuts and stings to minor aches and pains, this kit prepares you for those small everyday emergencies. Fits easily into a purse, pocket, school bag or glove compartment. Bulk Discount, purchase 10 at only $2.90 each! 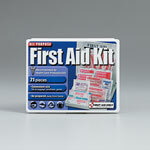 17 Piece Fundraiser travel first aid kit, mini plastic case, 1 ea. 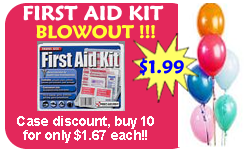 Bulk Discount, purchase 10 at only $1.67 each! 33 Piece all purpose School First aid kit, mini plastic case, 1 ea.